Known for his distinctive hieroglyphs melding ancient Incan, Egyptian, Arabic, Hebrew and Asian calligraphy with graffiti, RETNA has created a written language unto himself. RETNA draws dialogue with his imagery in his paintings. Retna has become an “eternal broadcaster” of sorts, shining a light to the kinetic urban soul of Los Angeles. Retna’s street artwork merges photography with graffiti style and paint, time with color, couture with street culture, the spiritual with the sensual, and fluidity with grit. RETNA became just as notorious for his ornate painting technique as his timeless style: he used paintbrushes mixed with the traditional spray can. Many of his pieces synthesize the line between fine art and graffiti, between power and opposition, between tradition and advancement, between the past and future. In 2000, he had his first group exhibition at the Contemporary Corruption Show at 01 Gallery in Los Angeles. He released his “Men of the Cloth” series at the Mendenhall Sobieski gallery in Pasadena, California in 2006. 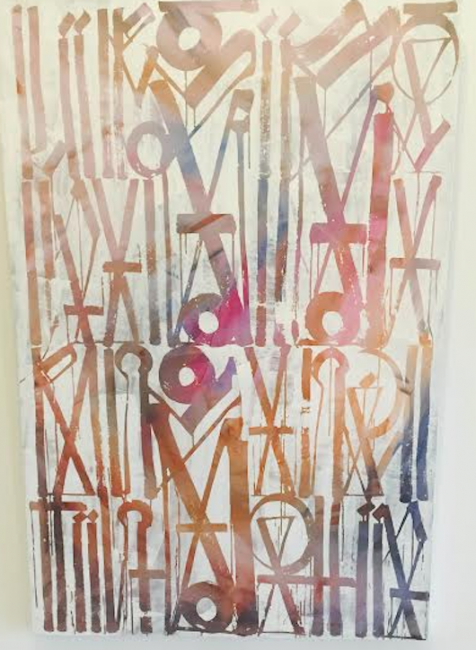 Today, Retna traverses between the galleries and streets with ease. In addition to being aligned with the Art Work Rebels and Mad Society Kings Art Groups, he is a member of the internationally exclusive art collective, The Seventh Letter, whose influence on contemporary street art encompasses the globe.